DEBORAH WOLF has 37 articles published. 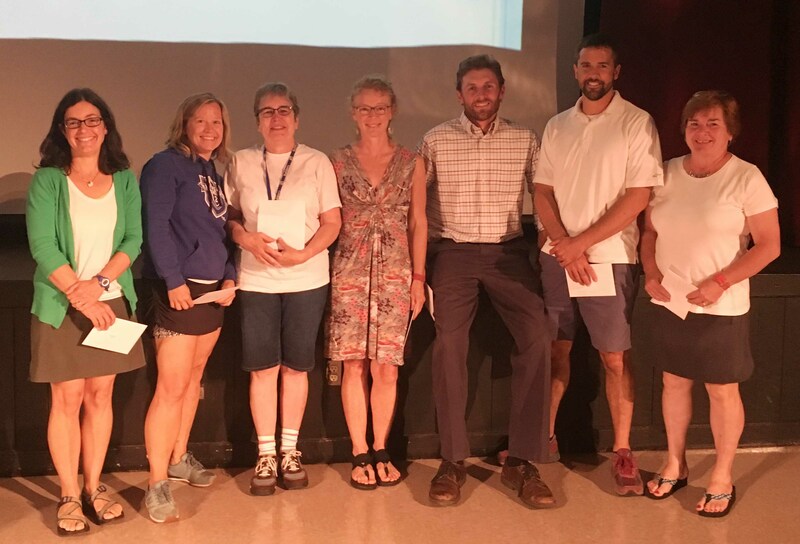 Sharon Grossi, Anne Decker, Paula Crossett, Meg Dawkins, Ben Heintz, Adam French, Ellen Shedd were honored for 15 years of service to Washington Central Schools on opening day, August 22nd. 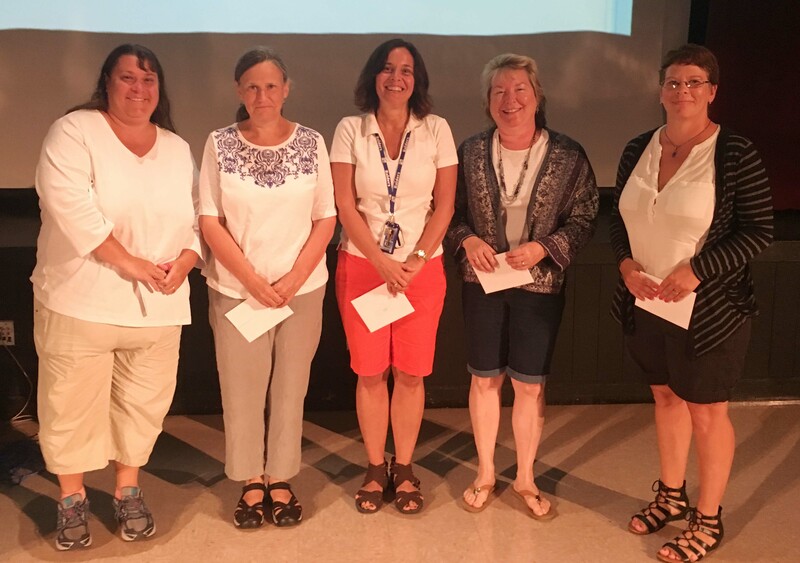 Lynn Wagner, Mary Carpenter, Lisa LaPlante, Tracy Martin, Jennifer Wiater were honored for 10 years of service to Washington Central Schools on opening day, August 22nd. 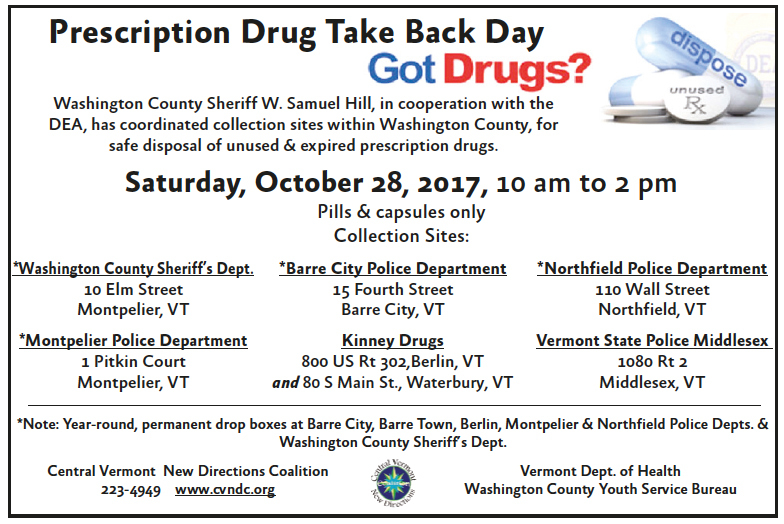 Washington County Sheriff W. Samuel Hill, in cooperation with the DEA, has coordinated six Collection Sites within Washington County for the safe disposal of unused prescription medications. Preschool bean harvest and 3/4 grade potato harvest. Students are currently focusing on garden harvesting, food preparation and tasting ripe, nutritious food grown in the Anne Burke Community Garden. On May 16, Berlin Elementary School students led a tour for Agency of Natural Resources Secretary Julie Moore of the school’s classroom, cafeteria, and outdoor composting system, which has turned more than 60 tons of food scraps into soil products since 2009. Students showed how their composting efforts contribute to healthy soils in recognition of International Compost Awareness Week. 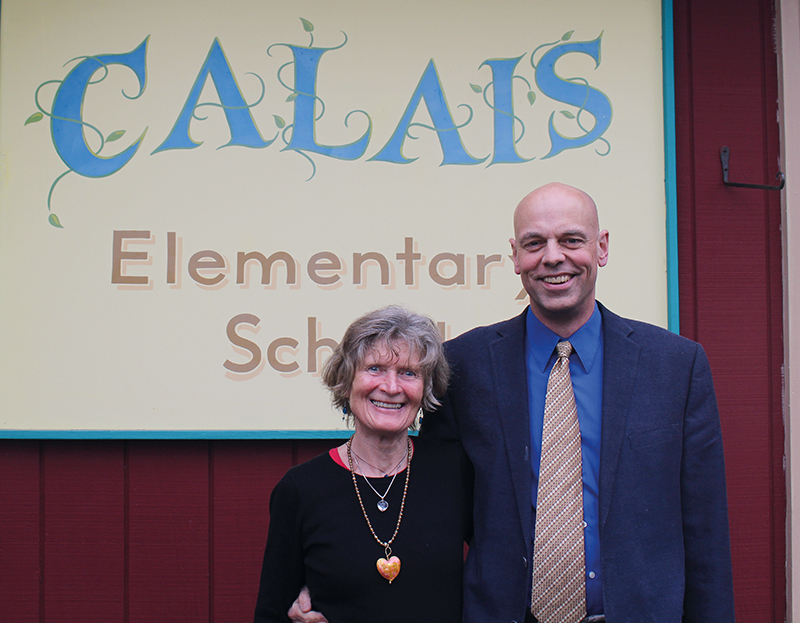 Heidemarie Holmes-Heiss and Steve Owens pose outside Calais Elementary. Both are leaving WCSU at the end of the school year. Heidemarie taught art at Calais and EMES 17 years and Steve taught music at Calais Elementary 25 years. (As of July 1 Steve is going to be the principal of the Albany Community School.) Congratulations and we’ll miss you! What is Act 46 and why should I care about it? Act 46 is a law passed by the Vermont legislature in 2015, inspired by concerns about rising property taxes, declining student enrollments, and a growing achievement gap among students. It requires Vermont school districts to explore new governance structures. The WCSU board organized a summer study committee, of representatives from each town, in June 2015, to research Act 46. 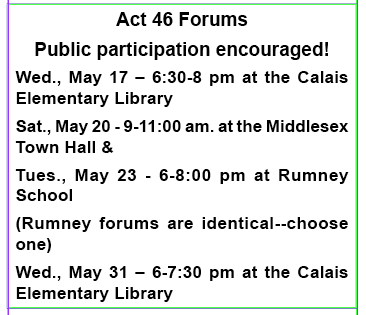 In September 2015 a formal Act 46 Study Committee was appointed with equal numbers from each member town and voting members. Recognizing the far-reaching nature of any recommendation to change the nearly fifty-year-old governance structure, committee members determined that a final recommendation would require the support of a supermajority—nine of the 11 voting members. The committee could not agree on a recommendation that was supported by the required supermajority, after eighteen months of work. The committee disbanded. 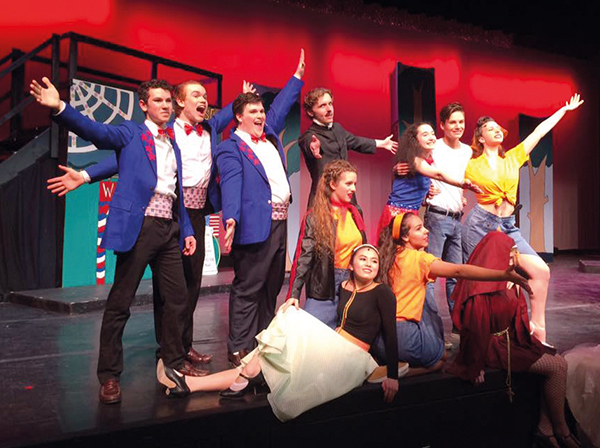 Stage 32 presented Cry Baby the Musical April 7-9 at U-32. 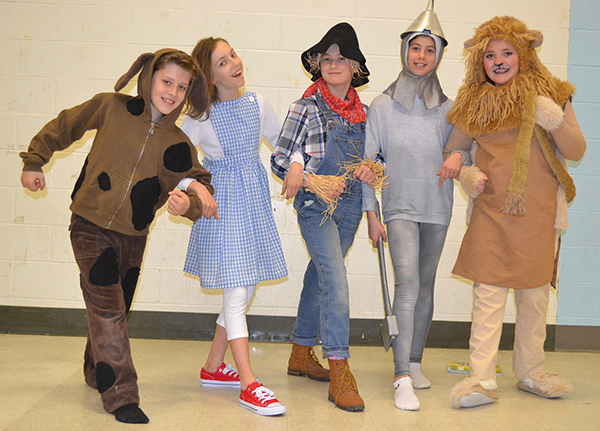 Rumney presented The Wizard of Oz April 7th and 8th. Theater has a big role in our elementary schools. 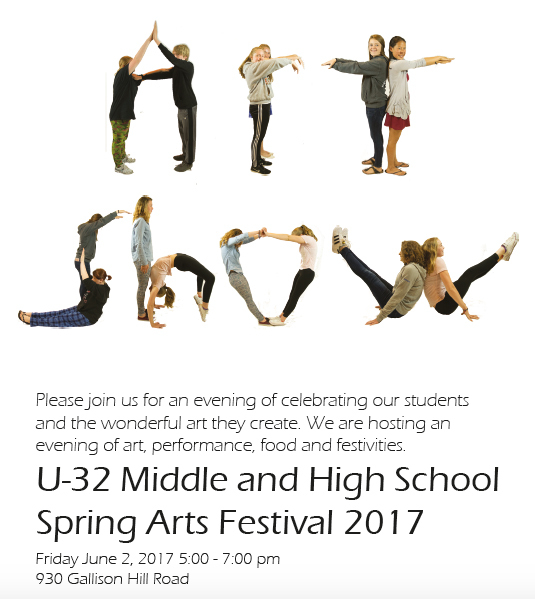 Kids love to prepare for and participate in dramatic productions both large and small. Here is a snippet of what’s going on these days.